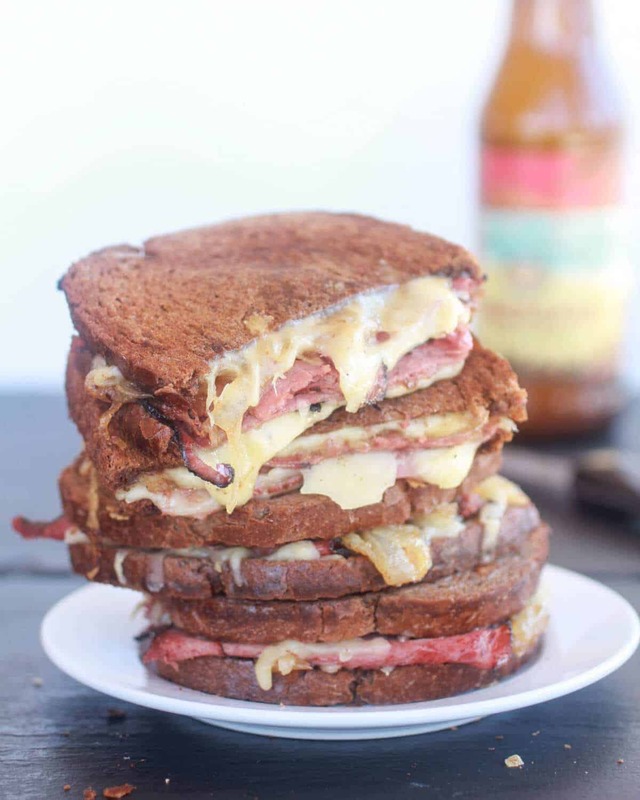 Pastrami and Caramelized Onion Grilled Cheese. And no, I did not flip any cakes upside down. Sorry, I know you were hoping for that! I got a package from Jose! Well, actually my Grandma sent me the package. Jose just delivered it. Wait. It is weird that I know my UPS guys name? Here is the thing, since he is here every day we have learned his name and I have also learned that he really like these cookies and this fudge. What? Well he is really nice and I have a lot of sweet’s lying around. So yeah, Jose is here pretty much everyday between 10:00am and 11:00am. Why is he here so much you ask? Red. He gets SO many boxes sent to him. Burton, if by some odd chance you are reading this, listen up. That kid does not need any more stuff! Our house is over-flowing with snowboards, coats, goggles, helmets, gloves, snow pants and hats. Seriously, we could clothe a small army. No joke. It is ridiculous. All over the box were the words Sur La Table. That is ALWAYS good. My grandma is awesome. She decided one day after talking with me on the phone to change her plans for the day and head over the The Gardens Mall in Jupiter, Florida (maybe the best mall) and park her car right outside the giant Sur La Table. She then proceeded to scour the store high and low for little goodies she could send me. And no it is not my birthday. because one, I NEVER get things and two, if I would want anyone to send me something it would be my grandma. We are kind of like two peas in a pod. We are alike in so many ways and well, let’s be honest she has amazing taste. The women knows how to shop and shop well. Whether it’s clothes, furniture or kitchen stuff you can guarantee she is going to pick something good. Expect to see some super cute yellow dish towels that just scream spring and some new little spoons and forks in the near future! Seriously, it has been way too long since my grandma and I have been together and shopped up some trouble. This gift was an awesome surprise, but it made me miss our little adventures even more! Now, about this grilled cheese that probably has you guys yelling at your computer screen “shut about you stupid box!”. 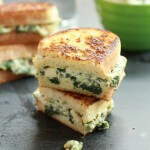 It is cheesy, crisp and a grilled cheese lovers dream. 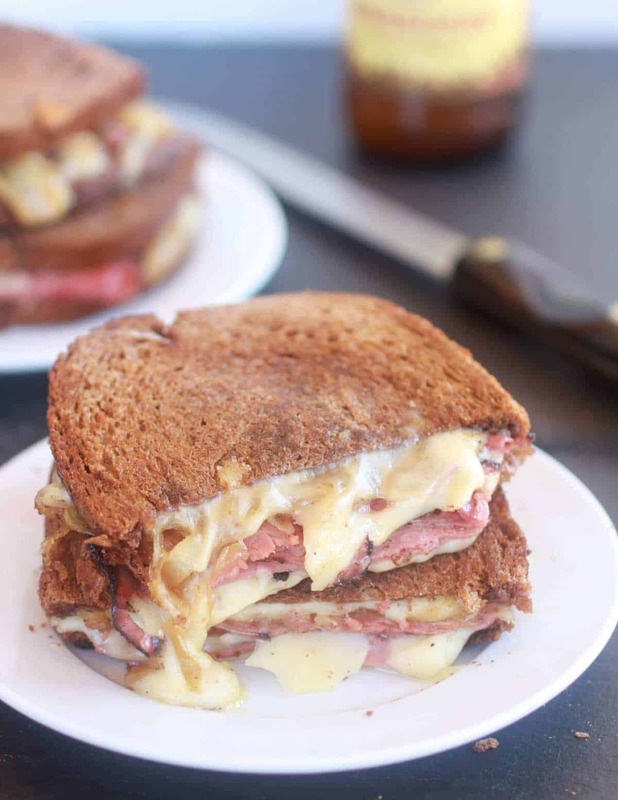 And my gosh it the perfect way to use up your leftover St. Patrick’s day corned beef that I am guessing a whole lot of you are planning on making. 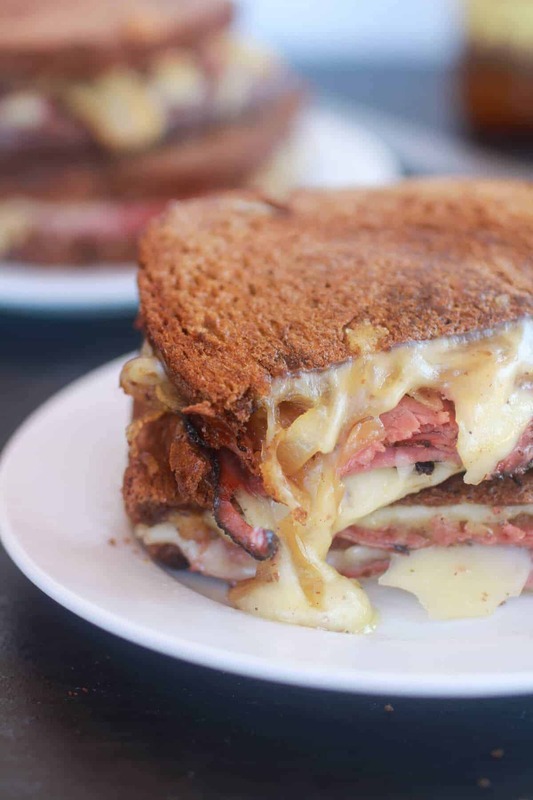 I actually used pastrami just because my family prefers a spicier meat, but corned beef is also delicious and just as good! Oh and, the beer caramelized onion’s, they are so good. Plus, it is just oozing with cheese. Nothing beats melty cheese! This sandwich is cheesy, crisp and a grilled cheese lovers dream. Melt 1/2 tablespoon butter in a large skillet over low heat. Add the onion and sprinkle with the sugar, 1/2 teaspoon salt, and pepper to taste. Cook on low heat stirring occasionally, until soft and golden, about 20-25 minutes (to speed the process up you can cover the pan). Add the beer and continue cooking, stirring occasionally until the onions are extremely tender and the liquid is slightly syrupy, about 8 more minutes. Remove from the heat and stir in worcestershire sauce and mustard. Transfer the onions to a small bowl and set aside. In the same pan add the pastrami and lightly crisp the meat until just warmed through. Remove from the heat and set aside. Lightly butter the outsides of all four pieces of bread. On the inside of the bread, divide half of the cheese between 2 of the bread slices. 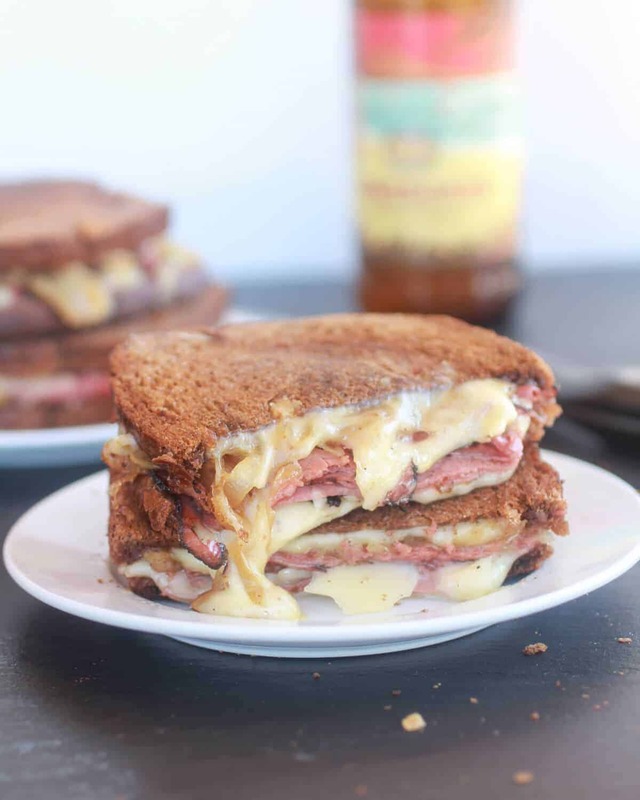 Top each piece of bread with equal amounts of hot pastrami, and onions. Top with the remaining cheese and then place remaining 2 pieces of bread on top of the cheese (buttered side facing out). Melt the remaining 1 tablespoon butter in a large skillet over medium heat. Add the sandwiches and cook, pressing occasionally with a spatula until the bread is toasted and the cheese melts, about 4 minutes per side, adding more butter to the pan if needed. I would suggest making this now! Don’t deprive yourself till Sunday. That’s just mean. 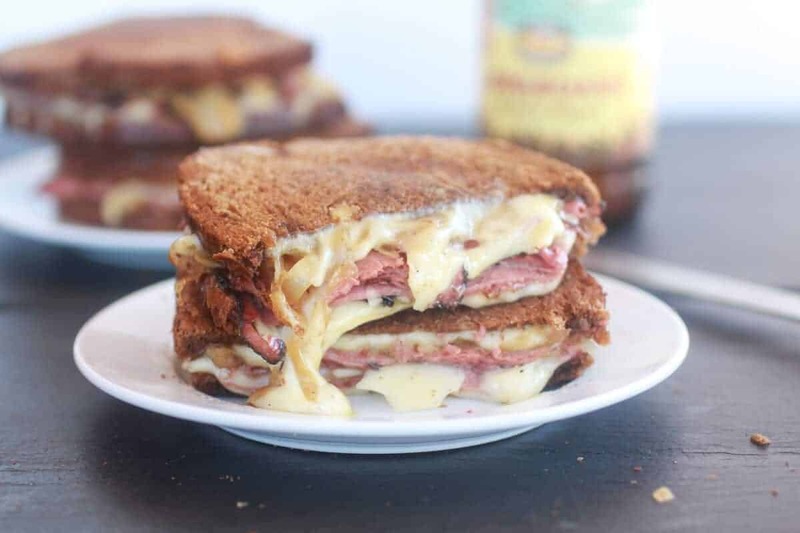 I LOVE yarlsberg cheese … These sound SOOO wonderful … I always put grilled onions on my hubby’s grilled cheese … Adding pastrami or corned beef is a GREAT idea. As always … Thanks again!!! This looks soooo good!! Without the onions for me, of course. I’m going to PIN THIS and pair this with some Guiness for St. Patricks Day! TFS. I found you today thru The Taylor House Linky. I hope you get a chance to stop by my blog and leave a comment, too! This would be a tasty lunch or dinner!! Yum! Um, yum. I want to eat the sandwich off the screen. I may be drooling. Totally making this tomorrow night!! Thanks for the recipe! YAY! hope you like it and thank you! Mmmmm… those look ah-mazing! 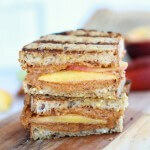 I love me a classic grilled cheese, but with all the add ons it makes me crave on of those sandwiches now! I’m defiantly pinning this! Want one right now! Pinned and will be sharing on Facebook tomorrow 🙂 Gorgeous photos as per usual! Trish, thank you so much! Your constant surport is very much appreciated!! Thanks again and have a great St. Patricks day! This sandwich looks amazing. Thanks so much for sharing it with Foodie Friends Friday. What an amazing-looking sandwich! 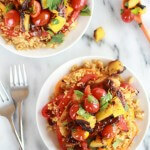 So over the top with perfect ingredients….Yum! YES! Thats my goal! Thanks for pinning! now that looks like one mighty tasty and perfect grilled cheese sandwich. 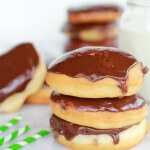 Stopping by from Tempt my Tummy blog hop. Have a great day. Thank so much Lauren!! I will try and head of to your party!! Blogging is making me very tired! I love making people drool!! Thanks for reading!! I’ve decided to make this a second time. First time was for the 2017 Eclipse! What a successful party sandwich! Second time will be the following Sunday for my sweet niece who is making a long day trip to visit me! 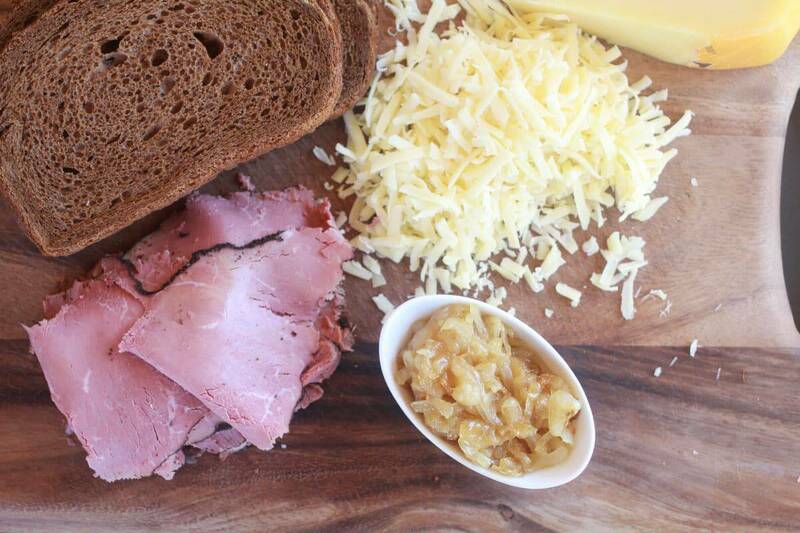 Yes, it’s messy to eat, which is just fine, since the sandwich is so wonderful! I decided on more mustard for the second time, since I wanted to taste it more. I’m using turkey pastrami because our other sandwiches are ham and beef. I’m using Provolone slices, but I cannot imagine that any white cheese would not be great. Ah so fun for the eclipse! Hope they’re just as good the second time! They sound like they will be amazing! Made this recipe I must say absolutely delicious,complements to you.The onions are incredible combo with everything else.thank you. A pretty half-baked idea. 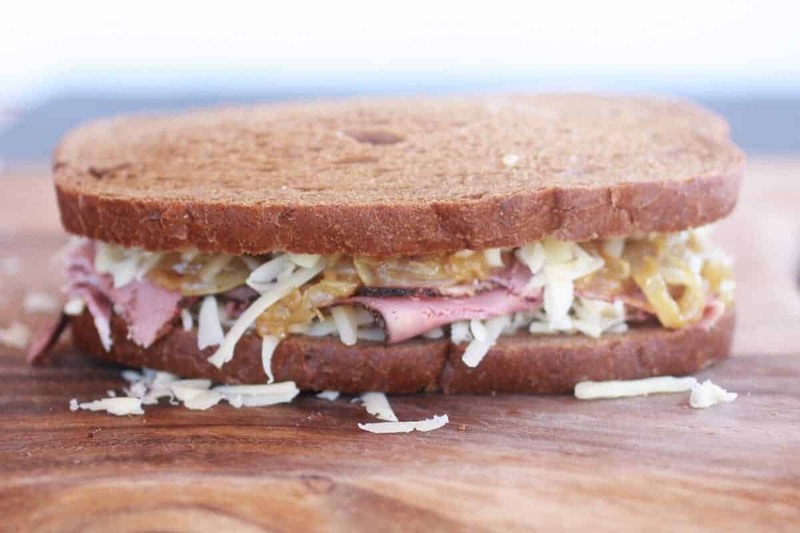 onions on pastrami makes no sense. I like to say, don’t knock it till you try it! I hope you do try this and enjoy it, Arty! Thanks!